Oak Brook, IL – October 4, 2017 – Dealers and perimeter access control experts see it every day – there is a growing demand among residential and commercial end-users for reliable, cost-efficient and hassle-free perimeter access solutions. And with the swift and efficient growth in solar-powered applications and manufacturing practices such as roofing and home energy, solar-powered gate operators have been on the fast-track to adoption for end-users and dealers alike. The LiftMaster family of solar gate operators features best-in-class power management systems that deliver power to operate any commercial or residential gate application with unmatched performance, power and reliability to quickly and safely access your property. In addition, LiftMaster provides dealers with the flexibility to customize each install with powerful add-ons such as wireless keypads, higher wattage solar panels, XL control box to accommodate larger batteries or added accessories. For dealers who have integrated LiftMaster solar gate operators and access systems into their portfolios, they can specify installations that not only offer safety and security but also meet the end-users’ demands for affordability, connectivity and sustainability. 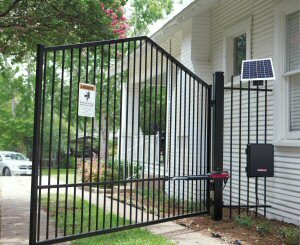 Prioritizing their selling process with solar gate operators as key perimeter access solutions for a variety of residential and commercial applications has energized their own revenue opportunities while saving the end-user $3,000 - $10,000 on average in incremental costs to run electrical to the installation and the monthly utility costs to power it. In addition to the long-term cost savings that solar affords, LiftMaster solar gate operators are also supported by the eco-driven, 30% federal tax credit for U.S. residents only. Extended through 2021, LiftMaster dealers can specify, sell and install quality LiftMaster Gate Operators while concurrently passing on savings to their customers. End-users who opt for a LiftMaster solar-powered gate access system are presented with the opportunity to apply for a 30% tax credit on the total installed cost. With the booming adoption of solar and the federal tax credit, perimeter access dealers are discovering new revenue streams through the specification of LiftMaster Gate Operators. Exceeding market demands ahead of competition, LiftMaster Solar Gate Operators rely solely on drawing power organically, eliminating hefty expenses and landscape disruptions. The system is extremely energy efficient and ensures that power is delivered to the operator and any system accessories, only when needed for operation, which minimizes battery power consumption and ensures gate operation is safe at all times. Additionally, the LiftMaster family of solar gate operator solutions debunk the common misconception that solar gate operators are designed for dry, arid climates. For homeowners and commercial building operators in the U.S. and Canada, solar gate operators from LiftMaster work effectively in all climates. “LiftMaster’s portfolio of solar gate operators provide end-users with a sophisticated, safe and environmentally conscious solution for gate automation. End-users are given instant peace of mind and the opportunity for long-term energy savings,” stated Jackie Lorenty, LiftMaster, VP/GM Perimeter Access Solutions. The LiftMaster portfolio of solar gate operators include residential models, such as the LA500PKGU, LA412PKGU, LA400PKGU RSW12U and RSL12U as well as rugged, heavy-duty commercial solar gate operators CSW24U, CSL24U. LiftMaster is the number one brand of professionally installed residential garage door openers, as well as a major manufacturer of commercial door operators, residential and commercial gate operators, telephone entry systems and related access control products. Driven by the access and security needs of the marketplace, LiftMaster’s expansive line of state-of-the-art residential and commercial products are designed to fit any lifestyle or application, providing the latest technology and innovations in safety, security and convenience. More information at LiftMaster.com.